Looking slightly south of southwest from Mount Sheogorath. The peak visible roughly two-thirds of the way to the right is the Hill of Suicides. Dementia is the southern half of the Shivering Isles. It represents the darker side of Sheogorath's madness, and tends to have dark colors, as opposed to the overly bright colors of Mania. The tangle of roots growing out of the ground can make it easy for a traveler to become lost. The main town in Dementia, and the only one which provides any services, is Crucible, which has an inn and a few shops. The two smaller villages of Deepwallow and Fellmoor can also give a typically-demented welcome to newcomers. Residents of Dementia are gloomy, depressed and paranoid; quite unlike the cheerfully insane residents of Mania. Order is kept by Dark Seducers, who fulfill the same functions as guards in Cyrodiil and the Golden Saints in Mania. 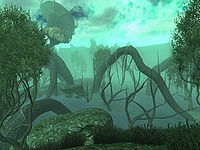 All creatures living in the Shivering Isles can be found in Dementia, with the exception of the Golden Saints, who are specific to Mania. Some creatures, however, such as the Elytra, are different in appearance from their Mania counterparts. Heretic's Horn - A peninsula south of New Sheoth, in Dementia. 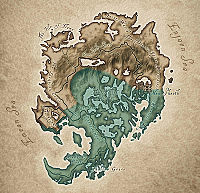 Madgod's Boot - A peninsula at the southern tip of The Shivering Isles. 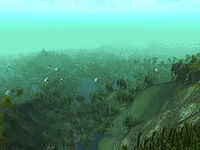 Shallow Grave - A lagoon located east of Madgod's Boot in southern Dementia. A list of places in Dementia can be found here. Ritual of Dementia: Kill the Duchess of Dementia and take her place. Everything In Its Place: "Liberate" a farm's Khajiit workers from the "cruel mind control" of their overseer. Ghosts of Vitharn: Set things right for the ghosts of a fallen castle. This page was last modified on 13 January 2013, at 05:33.